I am here with one more Trending fashion this winter . Though we are stepping into March , we still have chilly weather outside. I always try to keep up the fashion yet wearing warm clothes in winters . Today , I am talking about a chunky , soft knit sweater which is perfect for winters. This Lace up style is now trending fashion , so I chose this stylish yet comfortable high low sweater from ROMWE fashion. ROMWE is an International Online shopping store for Women . The most interesting thing about this online store is , they hold wide varieties of clothing for all occasions, starting from casual wear to party dresses , shoes , shoes accessories and jewelry. Absolutely loving their collection. And the most exciting thing is their prices are very affordable. 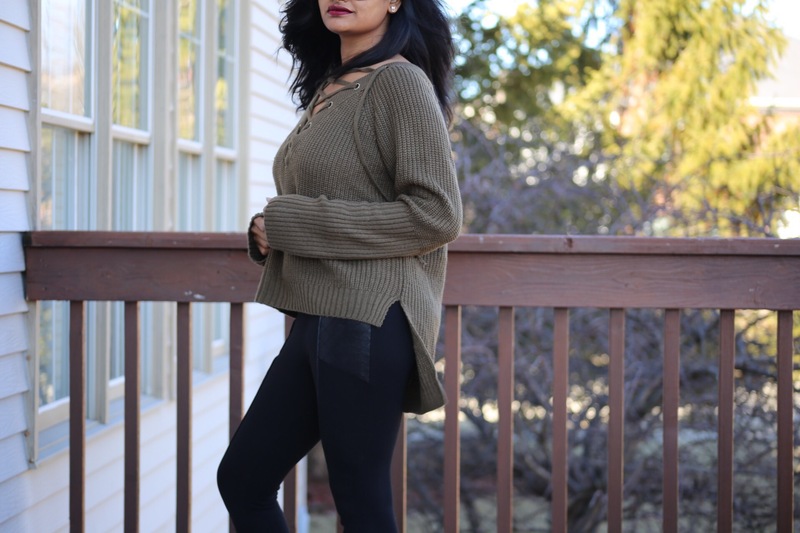 So I selected this Olive color Lace up sweater in their pool of trends as it is very comfortable and felt its perfect for winter. And I paired this sweater with leather patched black leggings which I felt is a perfect match. Right now ROMWE is offering 60% on your first purchase and up to 80% on clearance items. How exciting is that ! Do not forget to check it out and get Amazing winter and spring fashion items. Hope you have enjoyed this post !! The khaki jumper looks so amazing on you. I’m loving the lace up part so much!